I thought the Balrogs from the works of J.R.R. Tolkien might be an interesting subject for a post, and I actually found out something kind of amusing when looking up the topic. 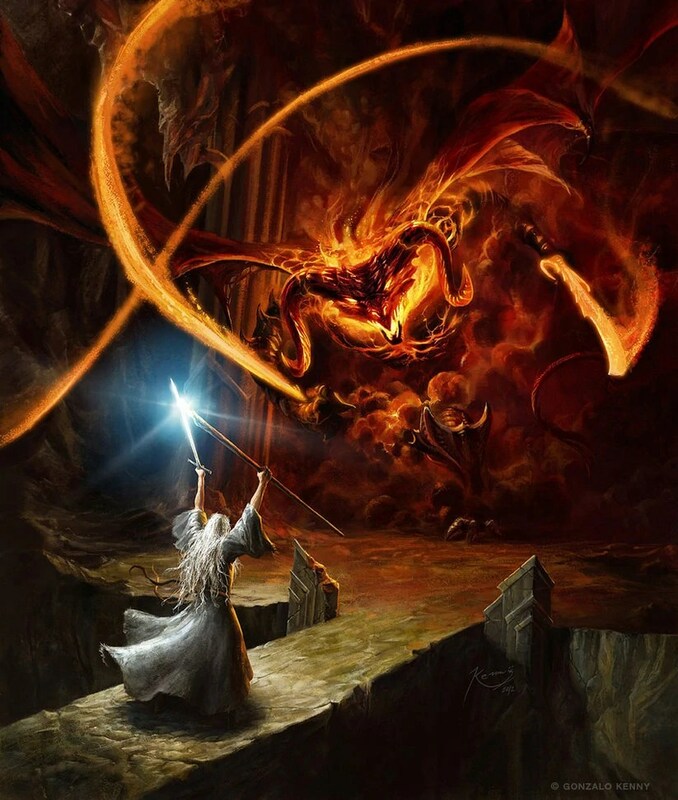 People who have read or seen the movies of Lord of the Rings know the Balrog as the monster that (temporarily) killed Gandalf, but there are others in Tolkien’s mythology as well. Apparently Christopher Tolkien insists there were only ever seven of them, but some references hint at more. The Balrogs were inititally angels, but were corrupted by Melkor and turned into demons of flame and shadow. They’re basically shaped like humans, but much bigger and obviously more monstrous, and they fight with fiery whips. 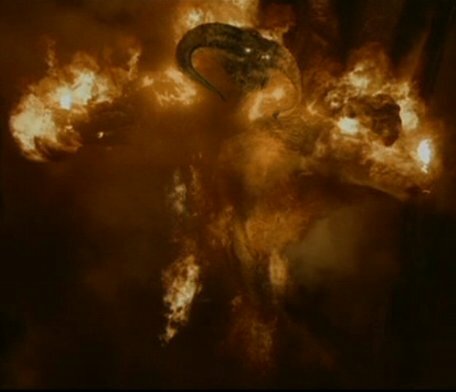 The most famous Balrog was known as Durin’s Bane, and hid in Misty Mountains after its master’s death. The Dwarves in Moria eventually ended up freeing it by delving too deep, and that’s how it happened to be around to fight Gandalf. The amusing thing I found about Balrogs is that there’s apparently a somewhat heated debate in the fan community about whether they have wings. The debate was fueled by two references in The Fellowship of the Ring, the first of which says that “the shadow about it reached out like two vast wings,” and the next mentions that “its wings spread out from wall to wall.” So were these literal or metaphorical wings? The Peter Jackson film did give the Balrog wings, but it never used them to fly. Balrogs have been referenced in non-Tolkien works as well. In Terry Pratchett’s Moving Pictures, one of the movies made is called Howondaland Smith, Balgrog Hunter, and a “Balgrog” is described as Morraine the Troll painted green. So here we have a case of one mythical monster dressing up as another, although the trolls of the Discworld are much less monstrous than those of other fictional worlds. Then there’s the boxer named Balrog in the Street Fighter games, although this is actually rather confusing. In the original Japanese version of Street Fighter II, the boxer was named M. Bison, a play on Mike Tyson; and Balrog was the Spanish guy who climbed on a fence. When the game was translated into English, the translators worried about getting in trouble with Tyson, so they switched the names around. The boxer became Balrog, the fence guy became Vega, and the general became M. Bison. Why they didn’t just change the boxer’s name to something totally different instead of mixing up everything is beyond me, but I can’t say I see any connection between Tolkien’s Balrog and either the boxer or the fence-jumper. This entry was posted in Authors, Discworld, J.R.R. Tolkien, Monsters, Street Fighter, Terry Pratchett, Video Games and tagged balrogs, christopher tolkien, gandalf, lord of the rings, m. bison, mike tyson, moving pictures, street fighter ii, the fellowship of the ring, trolls, vega. Bookmark the permalink. Bakshi’s Balrog in the 1978 animated version has wings.